Some large, active, pelagic marine fishes are heterothermic, using internally generated heat to maintain warm temperatures in the swimming muscles, gut, brain, or eyes . Some large, active, pelagic marine fishes are heterothermic, using internally generated heat to maintain warm temperatures in the swimming muscles, gut, brain, or eyes (Dickson& Graham 2004). Heterothermic fishes include representativesof the tunas (Scombridae), swordfishes (Xiphiidae), marlins (Istiophoridae), sharks (Lamnidae, Alopiidae), and perhaps the Giant Manta and Sickle fin Devil Ray (Mobulidae).The heat utilized is generally the result of either swimming muscle activity, processes associated with digestion, or ocular muscles that have become modified into “heater organs”. In all cases the heat is retained by a retea modification of the circulatory system that forms a countercurrent exchange mechanism. Heterothermic fishes that maintain elevated swimming muscle temperatures include some of the tunas, swordfish,and sharks. Their internal temperatures often are warmer than the surrounding water and remain fairly stable even as the fishes move from warm surface waters to colder Deepwater (Dickson & Graham 2004). Bluefin Tuna keep their muscle temperatures between 28 and 33°C while swimming through waters that range from 7 to 30°C (Carey & Lawson1973). Yellowfin Tuna maintain muscle temperatures at about 3°C above ambient water, whereas Skipjack Tuna keep their muscles at about 4–7°C above ambient (Careyet al. 1971). (A) The circulatory system of a “typical” fish sends blood from the gills down the core of the fish, making it impossible to maintain anelevated core temperature in cold water. Arrows indicate the direction of blood flow. (B) In the warm-bodied Bluefin Tuna(Thunnus thynnus), most of the blood from the gills is shunted toward cutaneous vessels near the body surface and is carried through a heat exchanging rete en route to the active swimming muscles, which stay warm through this heat conservation mechanism. After Carey (1973). net”), for the gas bladder. The oxygenated blood is warmed as it passes through the rete and travels toward the swimming muscles. In this way the heat generated by the activity of the large swimming muscles is kept within the muscles themselves and is not transportedvia the blood to the gills where it would be lost to the surrounding water (Dickson & Graham 2004). Bigeye Tuna can regulate their body temperature by utilizing the heat exchange mechanism only in colder water when it is needed(Holland et al. 1992). In most fishes, the red muscle tissue responsible for sustained swimming is located laterally and just below the skin,where it readily loses heat to the water. In the tunas, however, red muscle is located more centrally, along the spinal column. This arrangement of the swimming muscles contributes to the unique and very efficient swimming style observed in the tunas (termed “thunniform”) in which the high, thin tail oscillates rapidly while the body remains rigid(see Locomotory types). The evolution of thunniformswimming and the accompanying displacement of the red swimming muscles toward the body core put an insulating layer of less-vascularized white muscle between the heat-generating red muscle and the surrounding water(Block & Finnerty 1994). This muscle arrangement may have been a prerequisite for the development of the circulatory adaptations necessary to maintain elevated body temperatures(Block et al. 1993; Block & Finnerty 1994).Swordfish (Xiphiidae) also have their red swimming muscles more centrally located, and also possess an associated heat exchanger (Carey 1990). Smaller tunas also have retia (plural for rete) for heat exchange, but they tend to be located more centrally, below the vertebral column (Stevens et al. 1974). Cool blood from the dorsal aorta is warmed as it passes through the rete andinto the swimming muscles. It appears that this type of centrally located rete is found in smaller tunas that inhabit warmer oceans, whereas large tunas from colder regions have lateral retia, as shown in Fig. 7.2B. Large sharks of the family Lamnidae such as the White Shark, makos, and Porbeagle maintain elevated visceral and body core temperatures with a heat exchanging rete located anterior to the liver (Carey et al. 1981). Small retia also have been observed in the viscera and red muscle of two species of thresher sharks (Alopiidae; Block & Finnerty 1994), and Bernal and Sepulva (2005) reported elevated muscle temperature in the Thresher Shark. Some sharks and tunas, then, have found a way to take advantage of many of the benefits of endothermy by conserving and recirculating heat that would have been lost to the environment, thereby avoiding the additional metabolic costs of specialized thermogenic tissues. Another use of heterothermy in fishes is in warming parts of the central nervous system, especially the brain andeyes, which may enhance vision and neural processing in deeper, colder habitats, although this has yet to be tested(Block & Finnerty 1994). All endothermic fishes studied warm some part of their central nervous system, suggesting that this may have been a strong factor in the evolution ofendothermy. This is accomplished by the generation of heat by special thermogenic tissues and by circulatory adaptations that use blood warmed in other parts of the body. In Swordfish (Xiphiidae) and marlins (Istiophoridae) the superior rectus eye muscle, and in the Butterfly Mackerel(Scombridae) the lateral rectus eye muscle, have lost the ability to contract and instead produce heat when stimulated by the nervous system. When these cells are stimulated calcium is released from the sarcoplasmic reticulum, which would trigger contraction in normal muscle cells. Instead, this calcium is rapidly transported back into the sarcoplasmic reticulum by ion pumps and the continuous release and pumping generates heat (see Dickson & Graham2004). This thermogenic organ (the only vertebrate thermogenic tissue known other than mammalian “brown adipose tissue”) seems to have developed for the particular purpose of generating heat for the brain and eyes. Eye muscles of other tunas and the lamnid sharks do not appear to be modified as heater organs (Block & Finnerty 1994),but retia near the eyes apparently help maintain elevated eye and brain temperatures. The lamnid sharks also have a large vein that drains warm blood from the core swimming muscles to the spinal cord, thereby warming the central nervous system (Wolf et al. 1988). The diversity of heterothermic fishes, the different mechanisms employed, and the different locations of counter current exchange retia suggest that heterothermy evolved independently several times among fishes. This diversity also provides examples of convergent evolution of physiological strategies designed to retain heat. Counter current heat exchange is also found in other animals, including mammals, birds, and insects (Willmer et al. 2005). Five primary factors have been proposed as driving forces in the evolution of heterothermy: (i) the expansion of thermal niches; (ii) the stabilization of temperatures of some important internal tissues; (iii) an enhanced ability to detect thermal gradients; (iv) increased metabolic rates and faster recovery from anaerobic activity; and (v) increased growth rates (Dickson & Graham 2004; Crockett &Londraville 2006). In addition, it has been hypothesized that higher brain and eye temperatures may enhance neural processing and vision, that elevated gut temperatures may increase efficiency of digestion, and that increased swimming muscle temperatures may increase burst or sustained swimming performance. However, as logical and appealing as these ideas are, there has been little evidence accumulated to test them empirically. 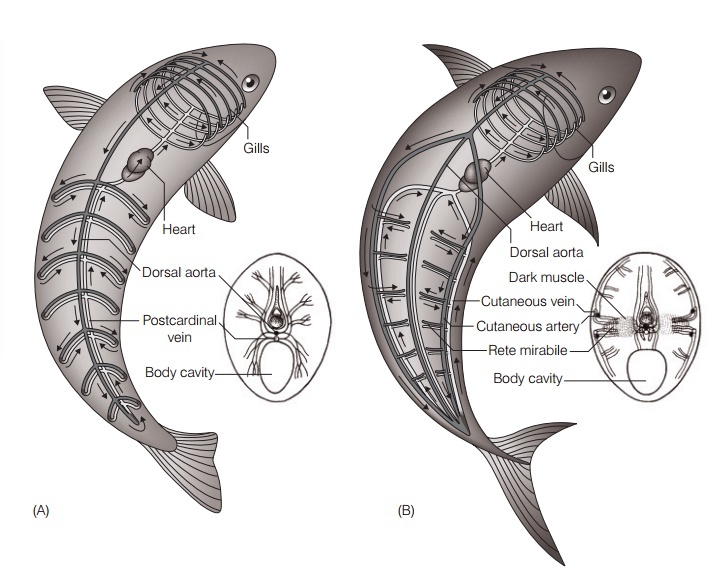 Dickson and Graham (2004) reviewed past studies and found some support for the niche expansion hypothesis tunas and billfishes with more active red muscle mass closer to the body core and with a well-developed rete tended to undergo vertical migrations to deeper and colder water than related species with more peripherally located red muscle and a less developed rete. Heterothermy may have allowed some members of the tunas, a generally tropical group, to utilize colder ocean environments (Dickson &Graham 2004). However, non-heterothermic fishes also use these habitats, so even if heterothermy helps some fishes it clearly is not a requirement for success. Block et al. (2001)reported that internally implanted electronic tags showed that the Bluefin Tuna maintained a relatively constant internal temperature of about 25°C while traveling through seas ranging from 2.8 to 30.6°C, and speculated that the elevated muscle temperature may enhance swimming in Coldwater. Dickson and Graham’s (2004) review did not find evidence that warmer swimming muscles improved swimming performance, but noted that the available studies had not adequately evaluated the largest fishes, which would have the warmest swimming muscles and therefore might gain the greatest advantage. Studies comparing heterothermic and similar-sized ectothermic scombrids have shown that the heterotherms have higher metabolic rates, andhence higher Energetic costs, but that the heterotherms also have higher optimal swimming speeds, which may be usefulfor long-distance migrations. More studies must be done to help us better understand the benefits of heterothermy in large pelagic fishes. The diversity of species exhibiting heterothermyand the multiple mechanisms that have evolved to permit it suggest that there must be some fairly strong evolutionary benefit.